This is one of the grafted Eucalypts that we have planted in our garden. It gives a nice splash of seasonal colour with the red and green. This is the first good flush of flowers we've had on this tree, last year the possums nibbled the new buds. One of the parents is E. ficifolia a red flowering Western Australian species and it's grafted on to rootstock of E. phytocarpa which has the common name " Swamp bloodwood" this is able to tolerate our more wet and humid summers. They are not cheap to buy, but certainly worth it for the beautiful colour they bring to the garden, plus they attract the native birds. For any fellow bloggers dropping by we wish you a joyful Christmas and happiness and health for the coming year. God Bless. Sometimes as you browse through the garden at night you come across special little happenings that send you scurrying for your camera. I didn't know until tonight that they were sharing acommodation. So we were pleasantly surprised to be greeted with this sight. 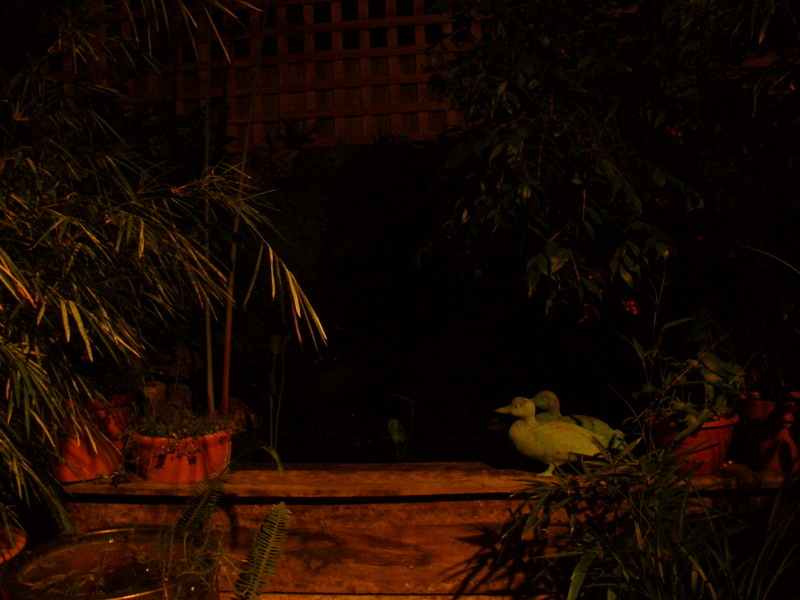 There is something nice about two different species of frog being neighbours in adjacent pots. I was fortunate to be able to take a snap of them as they popped their heads out the other night. The first shot has a Green tree frog in the lower pot and an Emerald Spotted tree frog in the one above. 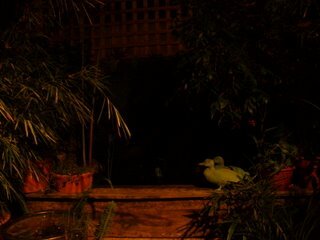 The second shot is two Green tree frogs, I'm not sure if they are an item and live in the same pot or not. It's quite fascinating to watch the little Eastern Sedge frogs making their calls, they are in full chorus tonight after a storm today. I once again apologise for being irregular with my posts. We have been regular visitors to Tamborine Mountain ( an hours drive south of Brisbane) for a number of years now. We've always loved the place and we've finally bought a little place to share with the family and friends. As you can imagine it's kept us pretty busy over the last few months. I will post some shots of Tamborine soon. Well..... we had the most unusual visitor come into our little gift shop last week. This dear possum came through the front door in the middle of the day and took up residence in the display shelving ( after dislodging what was there of course) There has been a bit of road works in the area recently so he was possibly a bit disturbed. Our main concern was to remove it safely, because should he run amok there was plenty of breakable giftware around. After finding out how expensive it is to get a possum removed we decided to do it ourselves. We taped a box to front of the space hoping it would move in. It was a very obliging possum and within a couple of minutes we were able to slide a piece of cardboard over the top and put him in the garden. Maybe he wanted someone to buy him. Just as well Larraine found him first, people might have thought it was a stuffed toy. I think you would get quite a shock. Our Green Treefrogs are starting to get very active, the storm season is underway and there is quite a cacophony of frog sounds at the moment. I have to say that the little Eastern Sedgefrog would come close to being our favourite frog. Firstly they are very cute and friendly . Unless you make a clumsy movement they generally let you get close with the camera without jumping off. They are quite often found resting in the daytime on a leaf or the stem of a reed. It's chirpy call is quite pleasant to listen to in the early evening. Hopefully if we get a little more rain with our spring storms they might breed. From what I've read Sedgefrogs like to breed from the end of winter onwards. the tadpoles need about 90 days to complete the cycle so they like to breed early. 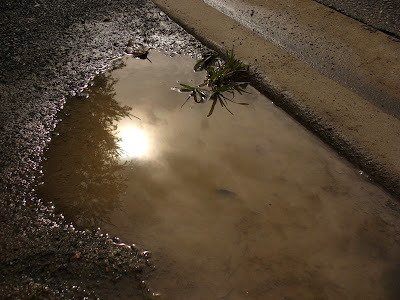 Well, here we have a puddle. Quite a rare sight in South-east Queensland of late. This was the result of two or three days of good rain which we had at the beginning of June. People were remarking on talkback radio that some of their little children had never had the pleasure of jumping in puddles. A pretty amazing thought when you consider most of us have fond memories of playing in puddles as children. In the reflection you can catch the sun just bursting through the clouds. We've had very little rain since unfortunately and our collective dam levels are down to about 17%. Like our frogs I've been in hibernation over the winter. Autumn is such a beautiful time of the year, lovely fresh mornings and warm days. Actually when I say warm it has been unusually warm for this time of the year 29-32deg. The good news for Brisbane gardeners has been that level 5 water restriction still allow bucketing the garden for 3hrs late afternoon on alternate days. Dendrobium and Cattleya orchids have been a delight this year and our Achmea Bromeliad has flowered for the first time. We hope everyone is enjoying a beautiful Autumn/ Spring depending on your geography. Because we have no garden on each side of the driveway Larraine came up with the lattice idea. we already had plenty of the terracotta hanging pots. For our first planting we chose compact miniature Zinnias in white , pink and orange. Below is Liriope which has a nice mauve berry type of flower. It's quite along driveway so it was good to brighten it up a little. We really are garden tragics just when we think we've done it all we find something else to do. Apologies for being somewhat slack in posting over the last month or so. I've been doing a few markets recently selling Hoyas, Bromeliads and Succulents as a fundraiser for African Aid, plus life is very busy as well. I hate making excuses but also I think I may have had a touch of bloggers block (something akin to writers block) . I must organise myself better to do a regular post and visit some favourite blogs. Anyway here in Brisbane the heavens have opened briefly and given us a few welcome showers, which as you can see has made froggarden's little inhabitants very happy. Unfortunately we still need what they call a "rain event" to stave off level5 water restrictions which take effect in April and could mean no outdoor watering at all, We'll have to wait and see. Before dinner tonight (Sat) I sat in the garden and listened to natures orchestra. With the water feature gently trickling in the background, there was the repetetive chirp of the cicadas in full chorus ( after recent welcome rain) Two Sedgefrogs were close by calling "reeek reeek pip" Striped Marshfrogs were not going to be out done they were there "toc toc... toc toc". Overhead the sound of batwings could be heard as they swooped between the trees. As I sat listening in the dark, I was thankful that although we only live 10 mins from the Bribane CBD we can be surrounded by so much of God's creation. Interestingly enough there was an article in todays Australian newspaper saying that native Australian birds are thriving in the nation's capital cities. Perhaps we owe a lot to our city planners, I know we have lots of parks and green belts which contributes so much to our beautiful environment. May everyone's New year bring good health and happy times.